Ah, California was GREAT! 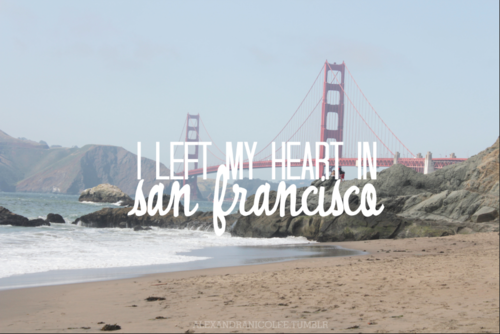 I’m totally obsessed not only with San Francisco, but the person I was while there! I left a tightly wound, stressed-out workaholic, and came back a mellow, nicely tanned chick. There’s just something about the air in California that cleared out my brain and had me smiling all weekend! There are a few differences between the New York me and the California me. For one, the New York me has bad hair. The California me embraced the awkward wave with aplomb! New York me wants to punch slow walkers in the neck. California me weaved cheerfully through the crowds. New York me gets burned to a crisp the second the sun peeks out from behind the clouds. California me also burns to a crisp, but it’s a California crispiness, and therefore fine. New York me stresses, California me strolls, takes naps in the middle of the day, eats burritos, and drinks Merlot! Listen, I love New York, and spent a solid twenty-three years of my life pining to live here. But this city does come with a constant level of stress and motion that’s hard to shake. The second I got off the plane on Sunday, I was back to rushing–to the Airtran, subway, the cozy covers of my bed. Everything is done at a frenetic pace! Then Monday I was back into the craziness of work, which has only become crazier! Rewarding? Yes. Relaxing? …Not so much. Tags: city life, relaxation?, vacation! !